The schools closed for summer by end June 2015 and our son Nikhil graduated from Grade 12. We decided to celebrate it with a camping out in the wilderness of Canada. Our family friends the Stephens also agreed to join the party as their son Jeevan had also graduated from grade 12. Joseph Stephen and Annie Stephen were both my mother’s students while at school and their daughter Jeena and our daughter Nidhi, both are university students. Jeevan’s friend Alex also joined us. The party being complete, I booked the camping site at Thunder Bay, about 1,500 kilometers from our home. Everyone was enthusiastic about the trip from the word go. The parents were really fired up and the children had to be. The preparations commenced with equipment procurement of two eight-person tents, one insect proof tent for serving of food, a portable charcoal barbecue etc. Administrative instructions regarding the clothing and bedding to be carried, meat to be marinated, veggies, bread etc. As the party was large with a good amount of administrative loads, a 12-seater van was rented for the trip. The van was a real boon that it could carry all the persons and the administrative loads and it facilitated relief for the drivers on the long journey. The aim of the exercise was to get the children out of their backyards, and into an environment that is going to allow them to see and experience nature unlike their home. Nature delivers a complete sensory experience; amazing scenery; glimpses of wildlife; vast starlit nights, and a great way to initiate the children to appreciate nature. Making the children live in harmony with the nature and without the luxuries they are used to at home, will surely make them better human beings and will kindle the survival instincts in them. The situations thrown up would make them come out with real time ingenious ideas to solve the problem at hand. The children will also get trained in setting up a camp, tent pitching, cooking, organising a camp fires, etc. The research shows that children who experience nature are happier, healthier and also helps with their cognitive development. The children were tasked to research and plan the itinerary to include the activities they would like to do enroute. 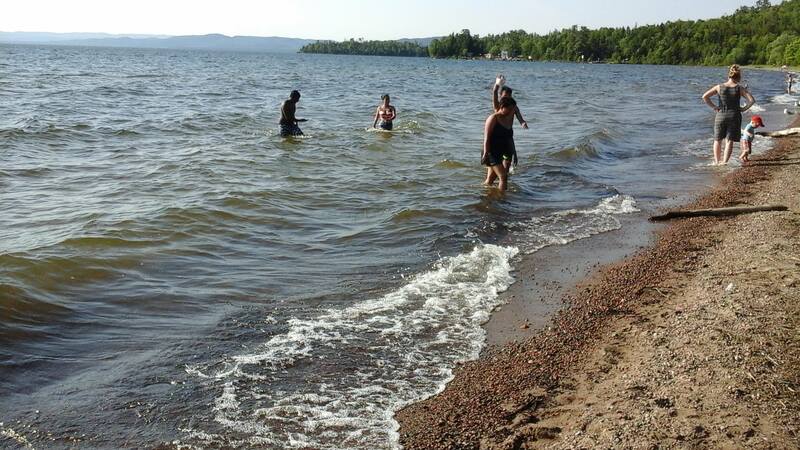 The first leg of the journey was the 1,500 kilometers drive to Thunder Bay and it commenced around 11 PM on 26 June after everyone returned home from work. Everyone took turns at the wheel and by the dawn of 27 June we reached Sault Ste Marie and stopped for morning tea. The Soo, as the city is nicknamed, was established by the French Jesuits in the mid-1600s French traders crossed Lake Superior in their quest for furs. Later, English explorers arrived, followed by lumbermen and exploiters of the mineral deposits. Sault Ste. Marie is a low-rise metropolis spread over undulating hills and flanked by the vastly wooded Algoma wilderness, with the St. Mary’s River at its door. The town is one of the gateways to the US and is located in the narrow neck between Lake Superior and Lake Huron. Canals and Locks, operated jointly by the US and Canadian governments facilitates lifting of ships about 21 feet from Lake Huron and Lake Superior. It is fascinating to watch a big ocean liners, freighters, barges, tugboats being raised and launched on to the next water level the year around. 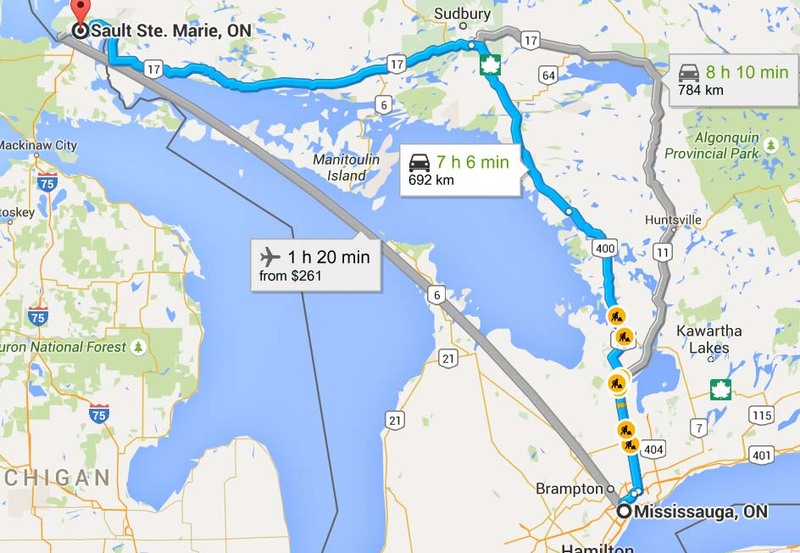 The drive from Soo to Thunder Bay was on Trans Canadian Highway (Highway 17). The highway passes along Lake Superior, the biggest fresh water lake in the world. The Trans-Canadian railway line also runs parallel to the Highway 17. The original Trans-Canada Route was Highway 11 (designated “The King’s Highway”) was started in 1923 and completed on a war footing to provide toad access to mining towns of Northern Ontario. In 1960, it was realigned and became the new and much shorter Trans-Canada Highway. Driving Westwards to the town of Wawa about 230 kilometers on the highway, the beautiful Lake Superior falls on the South with the dense forests of the Lake Superior National Park on the right with vast and beautiful area of wilderness known simply as ‘North of Superior’. As we drove along the highway, we could spot bears, deer in the wooded hills, sand hill cranes, turkey vultures feeding on an old moose carcass, an accident victim who might have had an encounter with a truck at night. All along the highway, there are signs to warn drivers about the dangers of wild animals crossing the roads. There has been many such accidents and many have lost their lives due to such accidents. The highway is a two lane road, one lane either way and mostly frequented by trucks, cars and a few buses. At many a places, there are small detours of about 50 meters, to park the vehicles. These detours have been mostly made at points providing a scenic view of the Lake Superior. There are garbage cans placed and these garbage cans are ‘bear proof’ and for the first-time user, a bit intriguing to open one. There are restrooms, picnic tables and a covered picnic area in some of them. These are the favourite spots for many bikers, cyclists and trekkers whom we crossed all along the highway. As we drove along, the landscape changed from rock and forest to a narrow band of farm land, known as the Canadian Shield’s north shore clay belt. 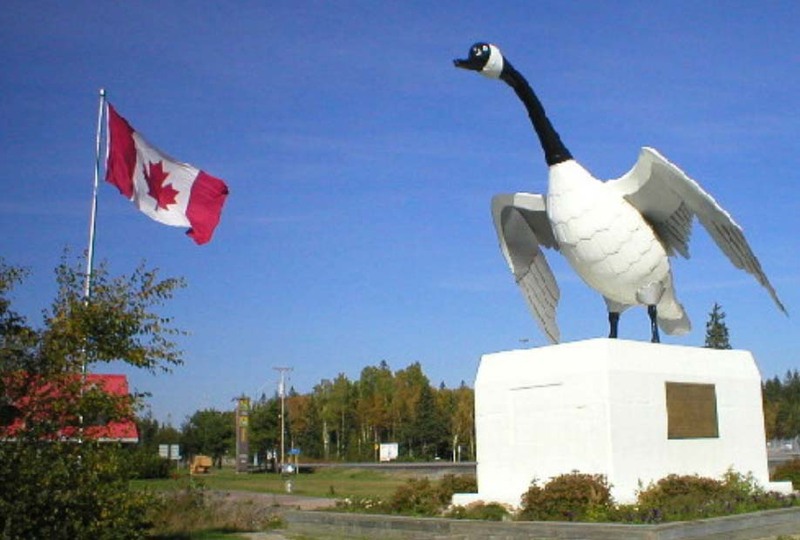 We reached the town of Wawa and at the entrance to the town is a large, free-standing, metal sculpture of a Canada Goose as ‘Wawa’ is an (Red)Indian word for Canada Goose. Wawa came into prominence in 1897 with the discovery of gold, followed closely by that of iron ore and more recently diamonds. The area is well known for its pulp industry as the forests around the town is abundant with soft wood trees. Wawa has a municipal air field and a few eateries and we had our breakfast here. 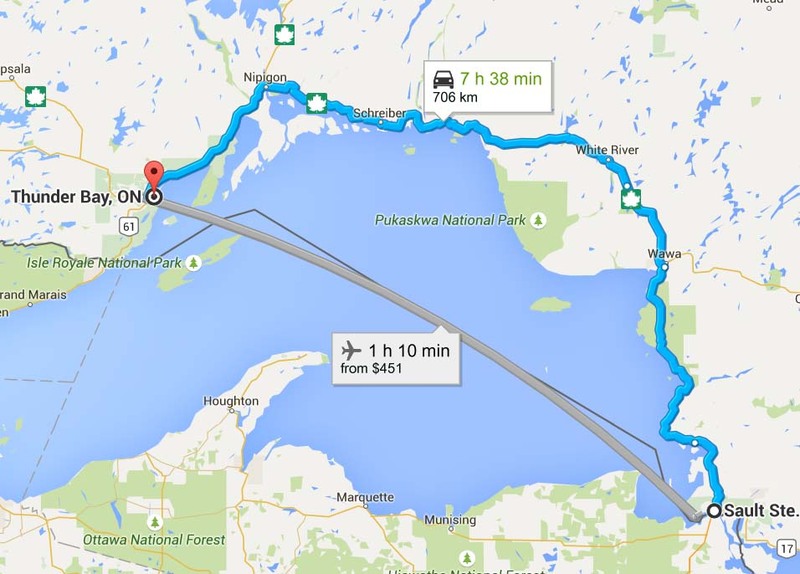 The next stretch of 480 kilometers was to the final destination – Thunder Bay. The road passes through the mining towns of through the communities of White River, Mobart, Marathon, Terrace Bay, Schreiber, Rossport and Nipigon. Most of these towns have shrunk due to the mines closing down. Only the paper pulp industry and farming seems to be active in these towns. We reached Thunder Bay by 3 PM. The city of Thunder Bay was formed by the amalgamation of the cities of Port Arthur and Fort William. Thunder Bay is located on the shores of a bay formed and protected by the Sleeping Giant rock formation. The myth is that the Ojibway tribal chief was cursed by the Gods as he let out the secret of the silver mine to the European explorers and was converted into a rock to guard the bay. Thunder Bay is a stopover for ships from around the world who have negotiated the St. Lawrence River and locks on the Great Lakes to reach the most westerly Canadian inland port. 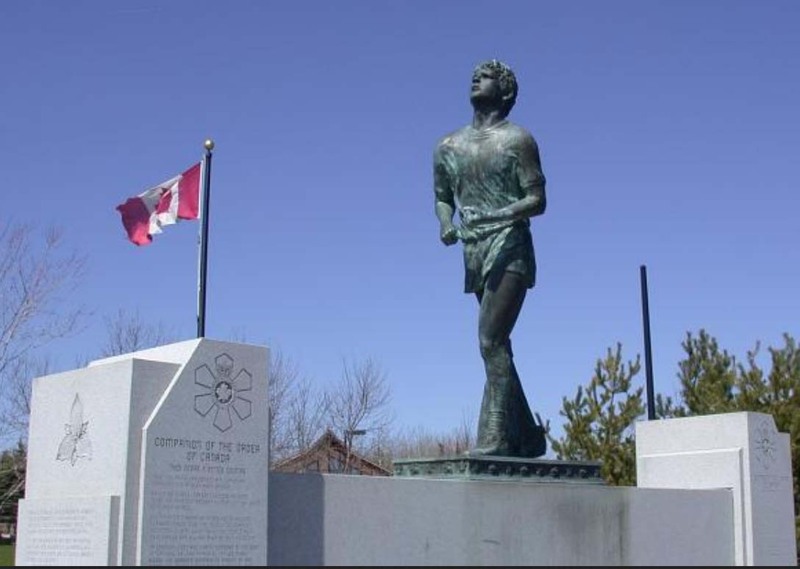 The Eastern edge of Thunder Bay is the site of the Terry Fox Memorial. The cross-Canada Marathon of Hope undertaken by this courageous young man ended near Thunder Bay when his cancer flared again. In 1980, with one leg having been amputated due to cancer, he embarked on a cross-Canada run to raise money and awareness for cancer research. Although the spread of his cancer eventually forced him to end his quest after 143 days and 5,373 kilometers and ultimately cost him his life. Terry Fox continues to be an inspiration for Canadians and Terry Fox Run is held in communities across Canada each year in September to raise funds for cancer. After driving about 1,500 kilometers North-West from the City of Mississauga on the shores of Lake Ontario, and along the shores of Lake Huron and Lake Superior; crossing 10 degrees Longitude to the West and 5 degrees Latitude to the North – we were still in the province of Ontario. Dear Reji,Excellent and adventurous. Congratulations. Well written and very educative.You were speaking some time ago about the same trip. Is n’t it?. Shall I forward the same to wegunners? Lovely. Lake Superior, Lake Huron brings memories of the geography learnt in Sainik School. I went to Kailash Manosarovar pilgrimage in 2006 and I remember the 15 days of staying in open and relieving ourselves in the open made me appreciate the quality of urban living with good toilets! nice and fluid. everyone WAS (not were). more if i notice something with my OrientLongman eyes!